Publisher Pearson, which owns the Financial Times, book publisher Penguin and Pearson Education, has introduced cloud-based collaboration using Google and Microsoft products. The cloud-based IT platform uses a charge-back system to provide desktop IT software for 45,000 employees. The system replaces Microsoft Exchange and Office 2003, which were limited to the Windows platform. This meant Microsoft software did not support multiple OS platforms. Graham Calder, chief technology officer, global platforms & services at Pearson, explains: “We wanted the coffee shop model.” He says the company wanted a new platform that could support any device, being used at any location and at any time. Pearson even partnered with Outsourcery to extend Office 365 with extra functionality the company needed, although Calder says the current version of Office 365 now includes these functions. He says legal, financial and HR people are heavy users of Microsoft Office, representing the 20% that choose the Microsoft option over Google. However, he says the take-up of Google is higher because it costs less. 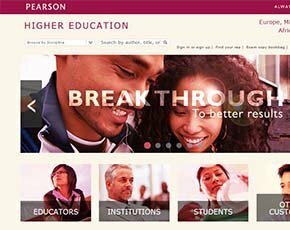 Pearson is using the best practices from Lean UX and Lean Start-up to rethink its education content strategy. Such methodologies are normally avoided in traditional businesses that generally have a set way of developing products. However, following feedback from students, faculties and prospective employers of students, the company started to brainstorm how it could make learning material more relevant. The company ran a workshop event organised and hosted by software development consultancy Neo, to develop the ideas to take its education products further. Neo ran a lean-process, hands-on design workshop, which enabled the company to develop a workable prototype in 5 days. Before Neo, Pearson staff had attended other brainstorming sessions, but these were dominated by virtual reality ideas. Given that students use Instagram, Facebook, Twitter and other social network feeds, Neo suggested an interface that could integrate pre-built social network with the educational material. Rather like a game, the student needs to react to these feeds while role-playing accounting scenarios, such as the figuring out the impact from an accounting perspective, of a fire or flood in a clothing factory. Among the big challenges for IT was how to migrate users smoothly onto the new platform. “We had a huge legacy of messaging systems so we needed to clear up domains.” With help from Google and Microsoft, Pearson developed a number of tools to support this migration. The company offers users Google Docs, Gmail, Calendar, Google Talk, Google Drive and Google Hangouts. Pearson's content is platform-neutral. Calder wanted to create an environment rather like a college campus. Users access the applications via a portal called My Cloud, which contains all applications that have passed the company's security requirements. All the company's primary networks are wireless local area networks (LANs). Wi-Fi is globally connected, so a user can walk into any office and connect to the LAN. The company has switched networking from MPLS to internet connectivity. “Our policy is to be cloud-first and that includes hybrid cloud.” Commenting on the switch away from the MPLS wide area network (WAN) often used to connect offices, he says: “If you partner with the right companies you get fast connectivity.” He also negotiated fixed price telco costs. The company has two people in IT who are dedicated to looking at new smartphones coming to market and provide users with recommendations. Calder should be sacked. Lacks customer knowledge (lacks knowledge of how Pearson companies operate, what they do and need). Pearson Technology (consolidated team) is a waste of money. Too out of touch with their customers. They have taken steps back NOT forward. IT staff were not even rewarded for delivering what they did (even though many don't like it). Fat cats got the cream again. Calder and Shore should run NHS IT projects....where projects are expected to cost more, and deliver little! I am glad I did not take up the share options.